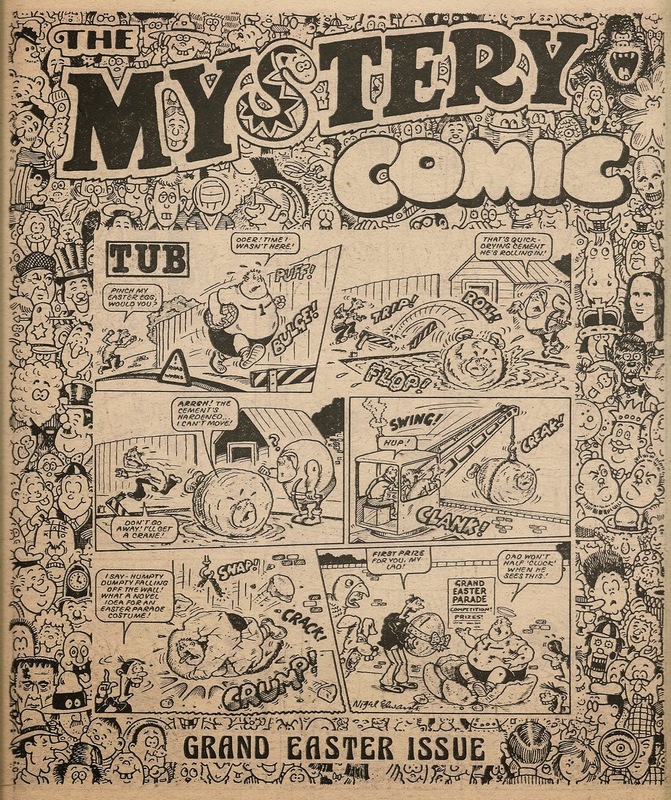 Cheeky's attempt to flush out a copy of the Mystery Comic in Cheeky Weekly dated 26 November 1977 involved his usual brush with wee Nosy Nora. 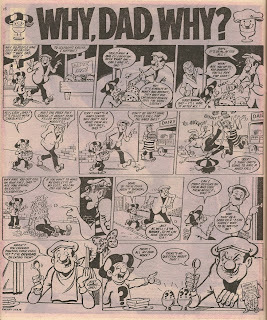 Initially, it seemed the toothy funster would have to read another comic in lieu of his favourite title. 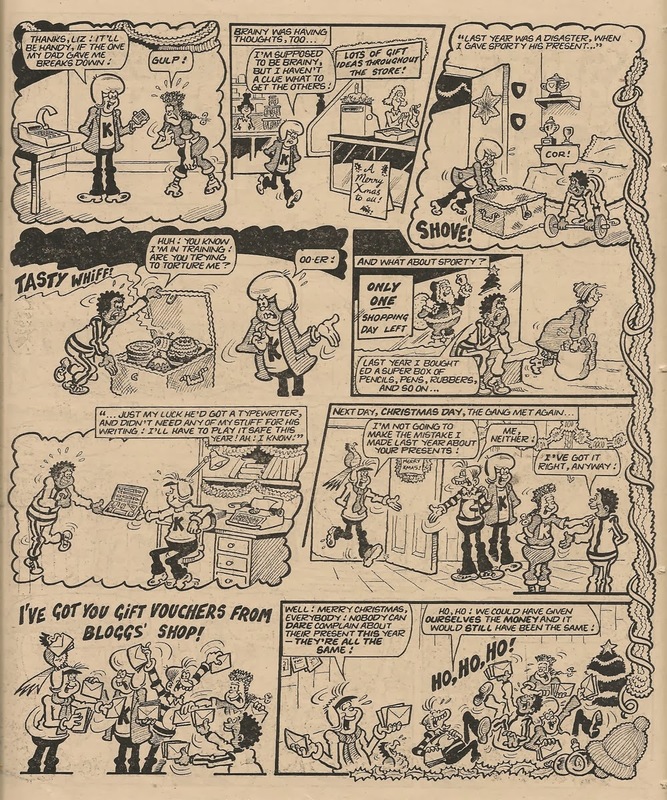 However, Cheeky's movements in pursuit of the mysterious paper began a chain of events that led him to the location in which his Great Uncle Daniel toiled. 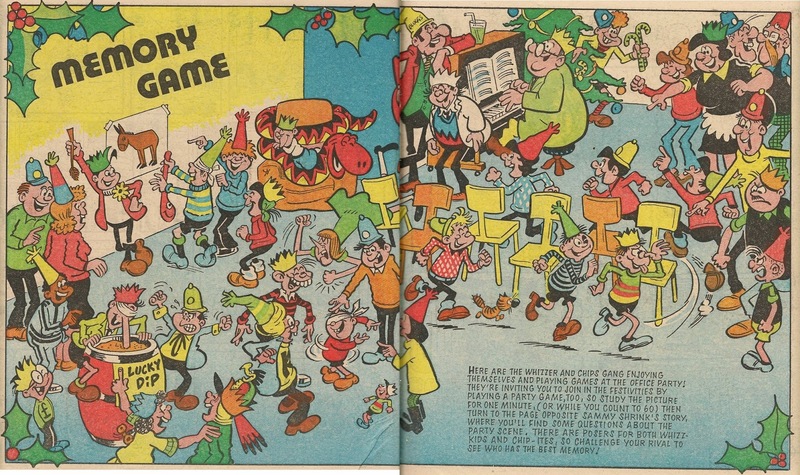 There was no riddle about Walter Wurx's arrival - for him that was bog-standard behaviour. 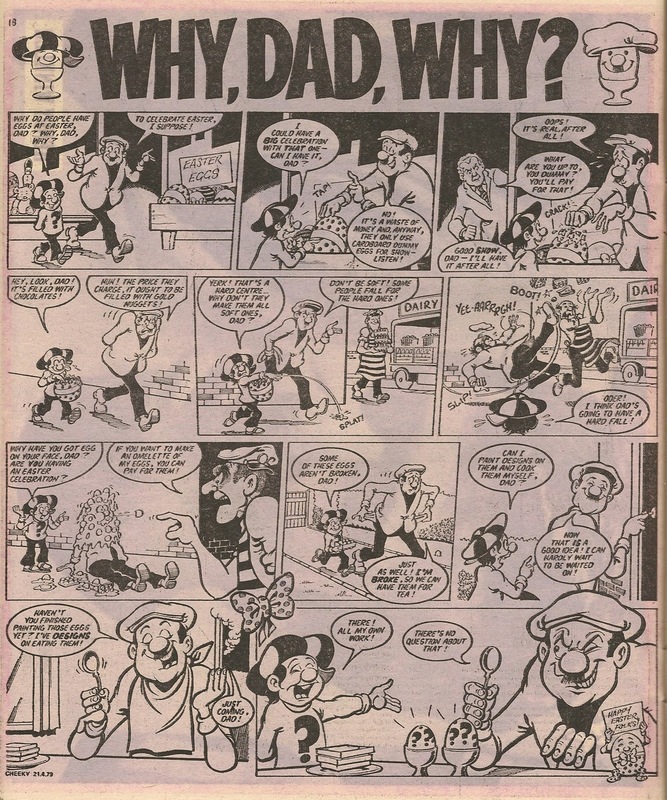 Cheeky's extravagantly moustachioed relative, whose face fungus prevents us from seeing whether his teeth share the same porcelain quality of those of his great nephew, was only too happy to relieve himself of a copy of that most mysterious magazine. This lavish scene was Great Uncle Daniel's only appearance in the toothy funster's comic. 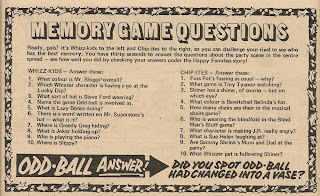 Maybe the Cheeky Weekly editor thought he was a little potty. Not to be confused with: school gardener Dan Dan the Lavender Man. 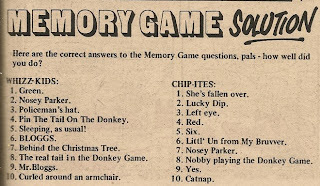 I hope you were engaged by this post, and didn't have a vacant expression while reading it. 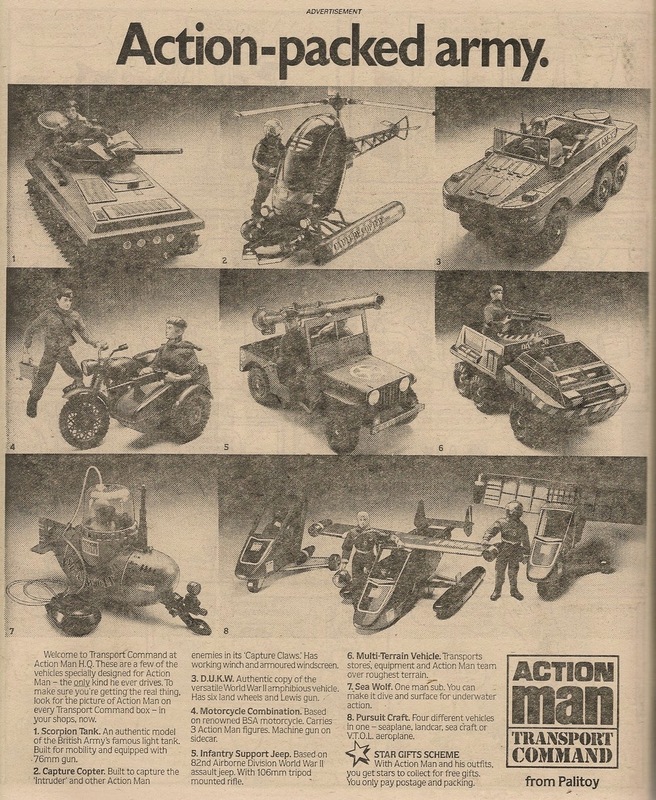 Despite the inclusion of the second part of the Top Ten poster, there's no mention of it on the cover. 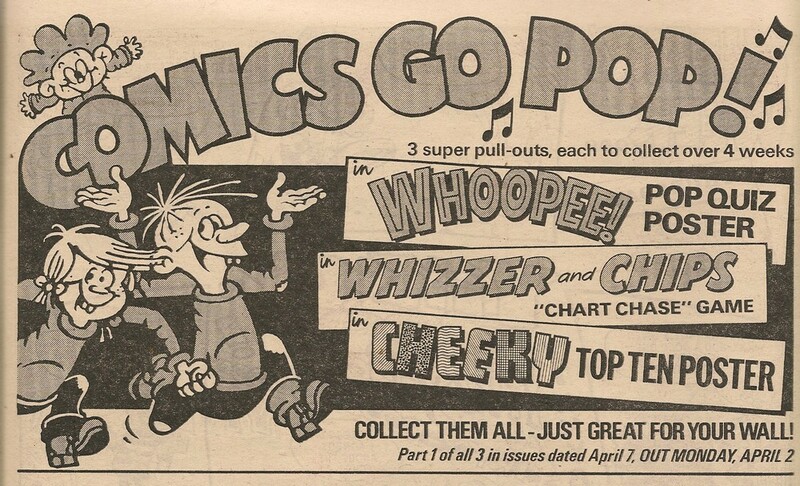 One might have expected the Cheeky Weekly editor to advertise the poster's continuation as a reminder to comic fans in possession of last week's issue but vacillating over the tempting titles strewn before them across the newsagent's counter. Nevertheless, the comic dives straight into Cheeky's Sunday paper round encounters with Bump-Bump Bernie and luscious Lily Pop. 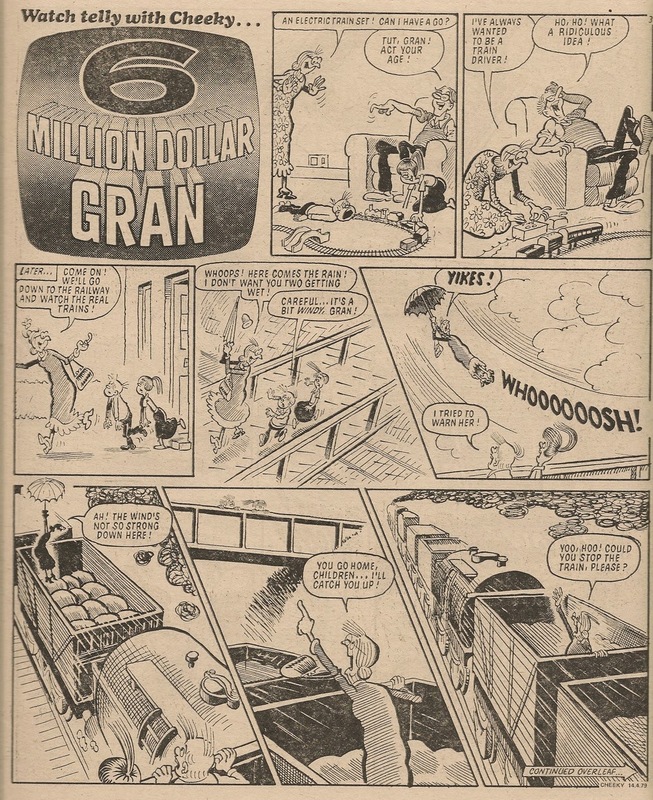 There's trouble on the tracks in this week's 6 Million Dollar Gran episode, which features some typically eccentric work from artist Ian Knox – I enjoyed the train rearing up on its hind wheels as the synthetic senior citizen super-stokes the boiler. 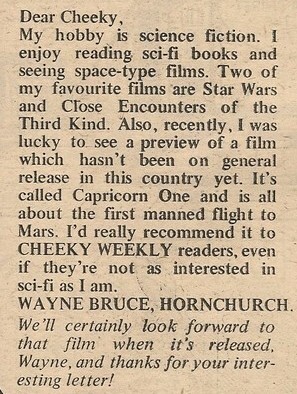 One of this week's Paddywack jokes is contributed by sci-fi fan Wayne Bruce of Hornchurch, who had a letter published on the Chit-Chat page in Cheeky Weekly dated 13 January 1979. I'm still not sure whether his name is genuine. 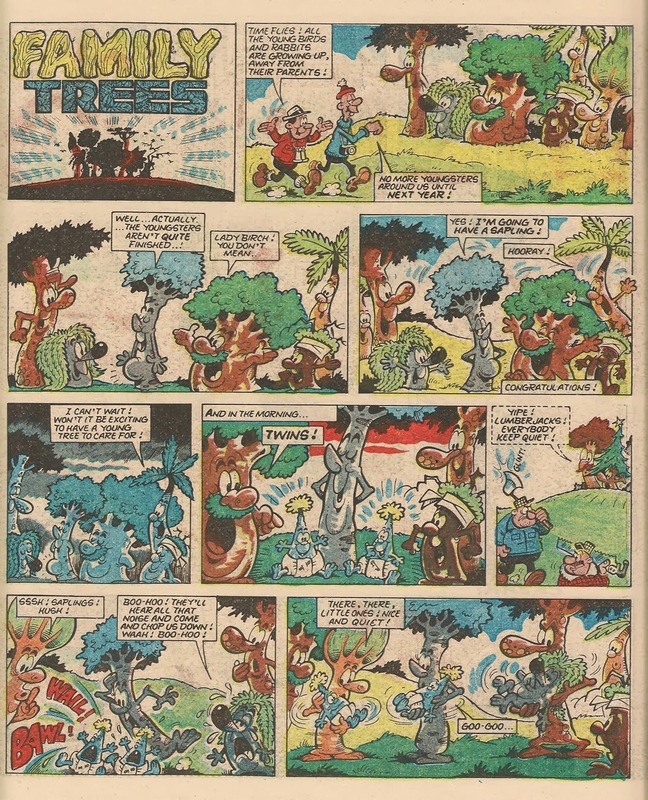 Cheeky's regular search for The Mystery Comic leads him to somnolent schoolgirl Snoozin' Susan, who is using a copy of said perplexing publication as a pillow while enjoying a park bench doze. 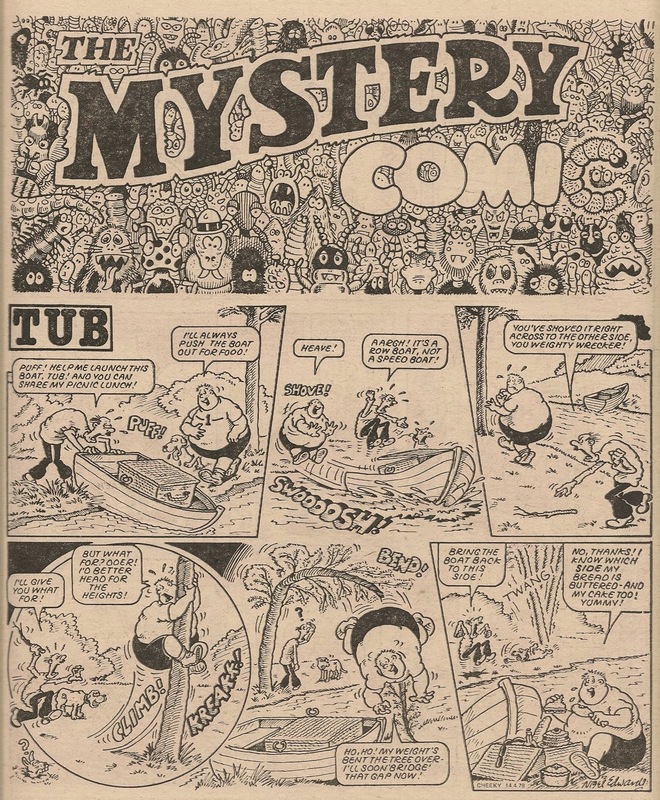 Mystery Comic cover star Tub's tale is a variation on the old fox, chicken and sack of corn conundrum – in this case Dad's task is to ensure that he, Tub and (most importantly) a picnic lunch are transported in safety across the river. 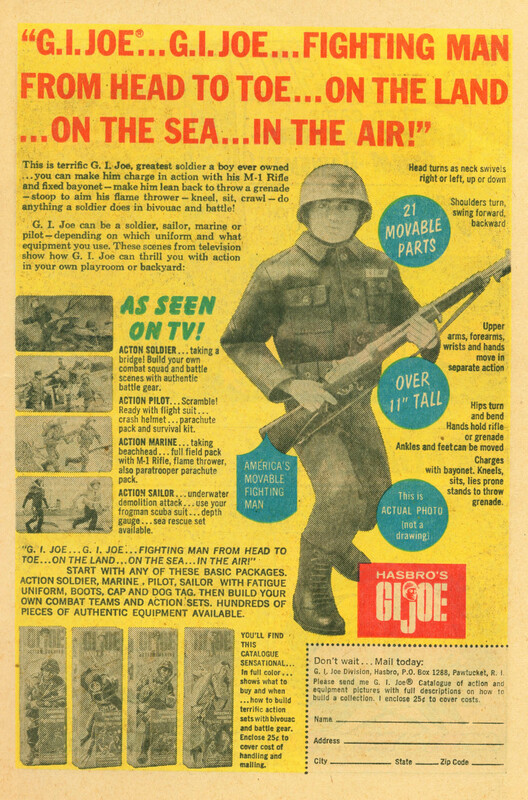 Cheryl Ladd and the members of Blondie are the subjects of this week's instalment of the Top Ten poster (occupying 4th and 7th position respectively), and the quality of the photo reproduction hasn't improved since last week. At this point in Cheeky Weekly's history, the toothy funster would locate his copy of the Mystery Comic every Wednesday and therefore, within Cheeky Weekly's daily chronology, the events depicted in the Mystery Comic section are related to Wednesday 11th April. Thus, readers may consider Disaster Des' Easter egg – based Mystery Comic contribution to be rather premature (Easter Sunday in 1979 fell on 15th April), but printing his story in next week's issue, its Mystery Comic location associating it with 18th April, would render it rather late for Easter celebrations. 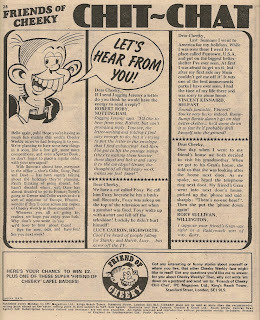 For the second week running, IPC's promotional Star Guest feature (on this occasion hosting Sweeny Toddler from Whoopee!) 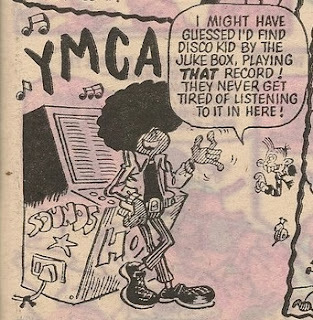 intrudes upon the pages of The Mystery Comic. 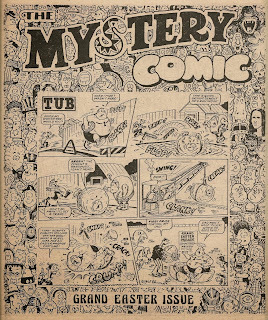 The Mystery Comic rounds off with Mustapha Million, followed by an ad for KP's salty, space-themed snacks, Outer Spacers, informing consumers of the crunchy cosmic crisps that their purchases entitle them to enter a competition in which Raleigh bikes can be won. The father and son team from Why, Dad, Why? 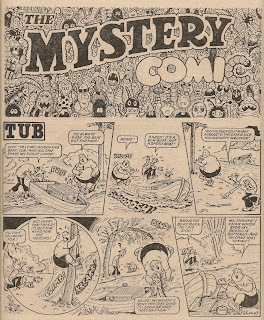 are absent from this week's Mystery Comic section, bumped by Sweeny's Star Guest appearance. 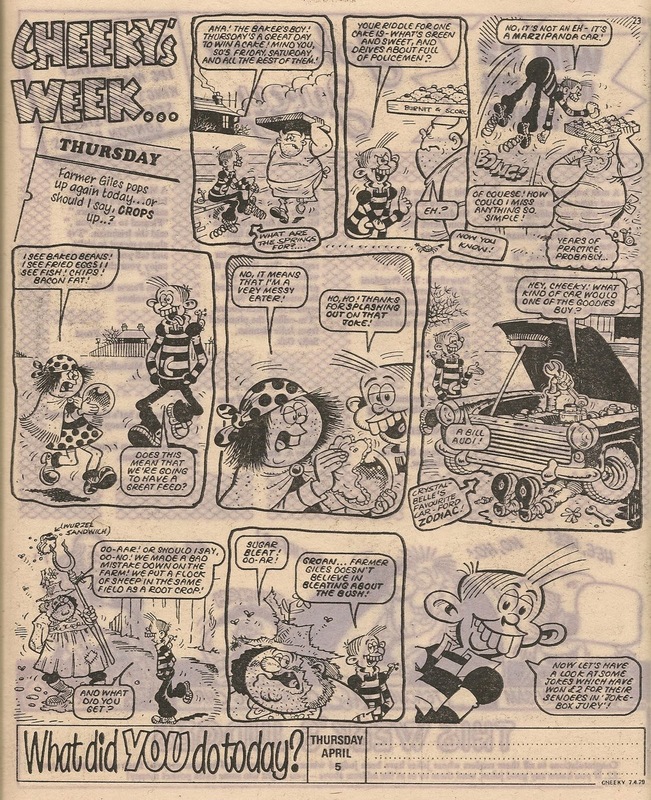 The image of Cheeky without his shirt appears for the third consecutive issue – it originally graced the cover of 31 March 1979's Jersey issue, then appeared again on last week's front page, and now turns up pasted into the final panel of the Thursday page. 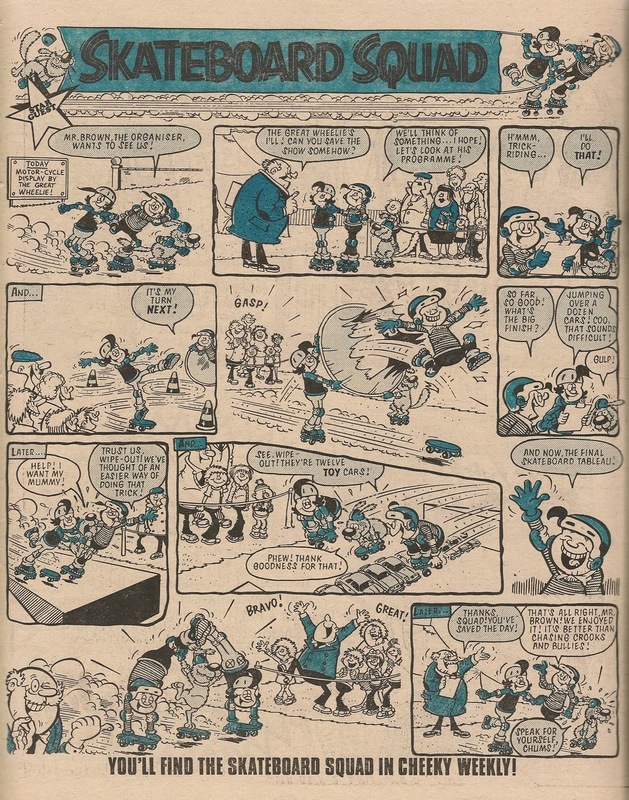 This suggests that the original final panel introduced the Skateboard Squad who are absent from this issue, necessitating a swift cut-and-paste and change of dialogue to herald a half-page Joke-Box Jury. 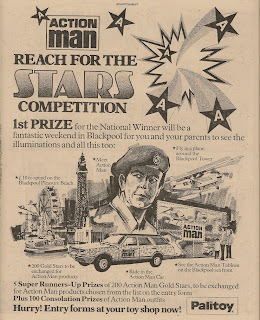 Maybe the staff artist who did the alteration still had the image he had cut out for use on last week's cover. 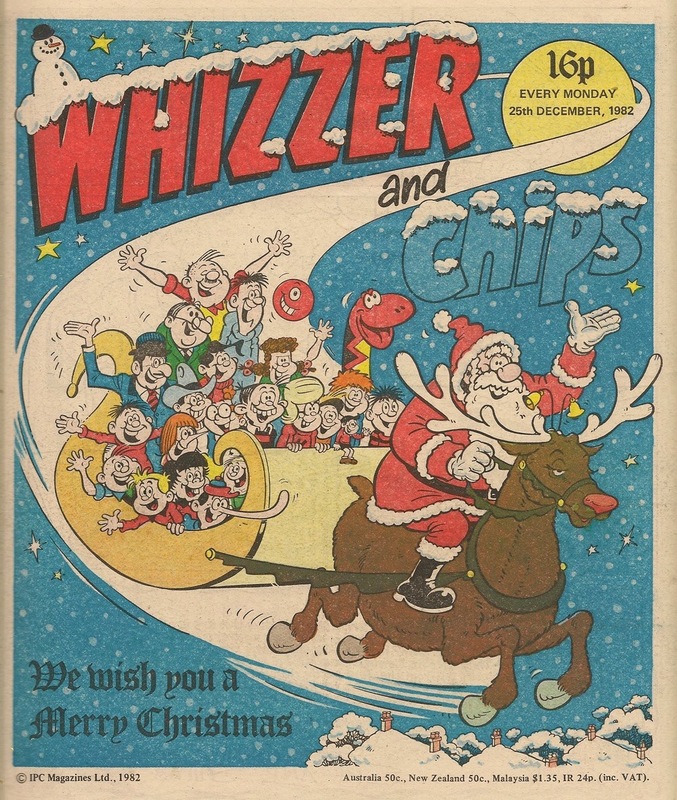 IPC missed a sales-boosting opportunity by not mentioning that Skateboard Squad fans missing the intrepid trio can see them making their own Star Guest appearance in this week's Whizzer and Chips. 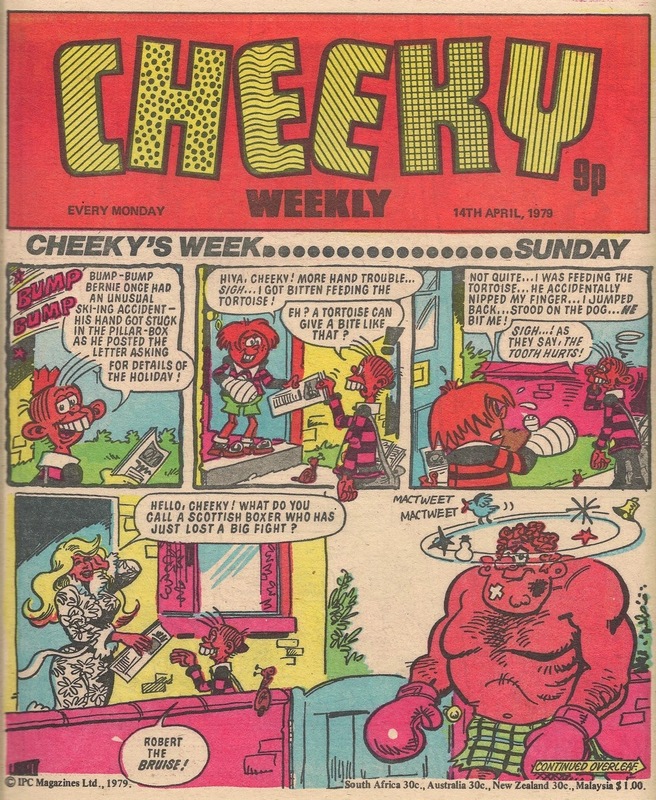 Cheeky's final outing for the week, Easter Saturday, takes him to the YMCA, where our toothy pal enjoys his first encounter with mirthful mesmerist Hypno-Tessa. 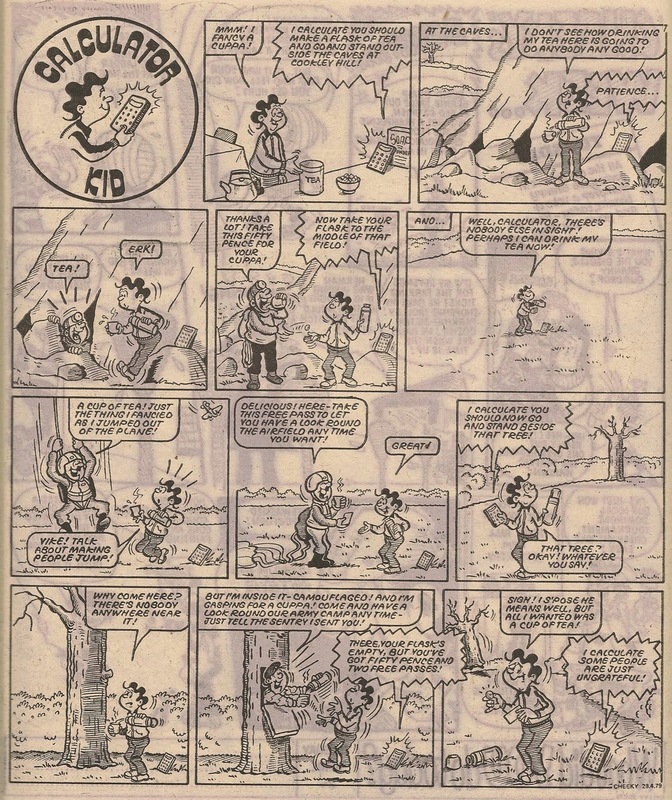 The issue reaches a conclusion with the back cover's Burpo Special, the subject of which is affable agrarian Farmer Giles. 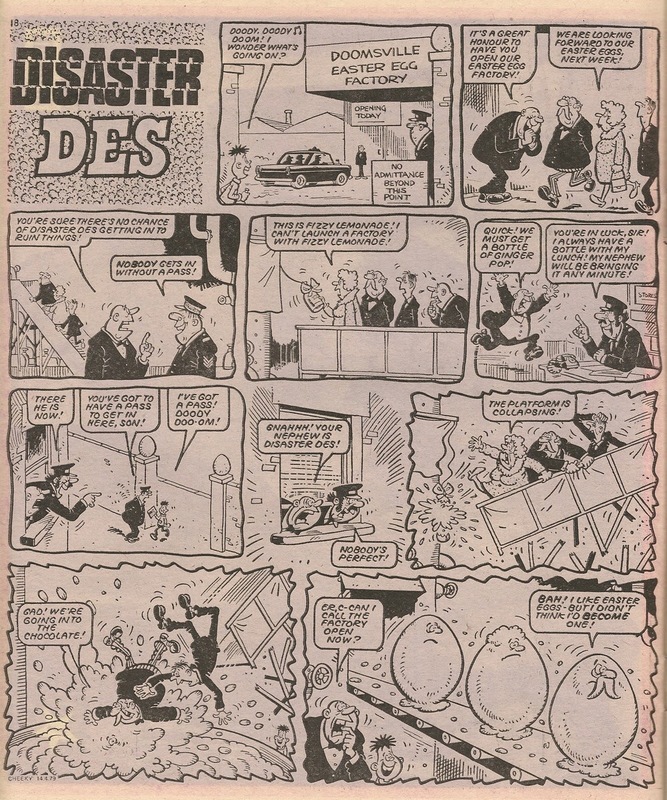 Pure Frank McDiarmid art tops and tails this edition, with his front cover Cheeky's Week...Sunday and the back cover Burpo Special. 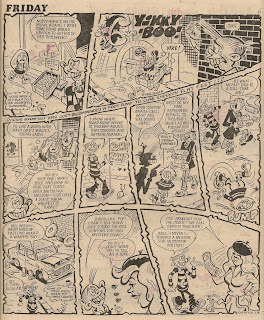 The eight internal Cheeky's Week elements are drawn by what I believe is an artist collaboration that I refer to as Frank McDiarmid Pencils (see link under Thursday image above for more details). 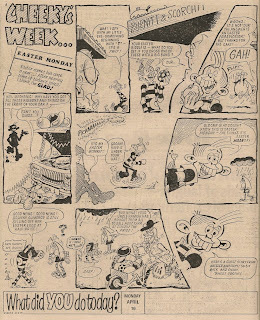 This is the only issue of Cheeky Weekly to identify Good Friday and Easter Saturday. 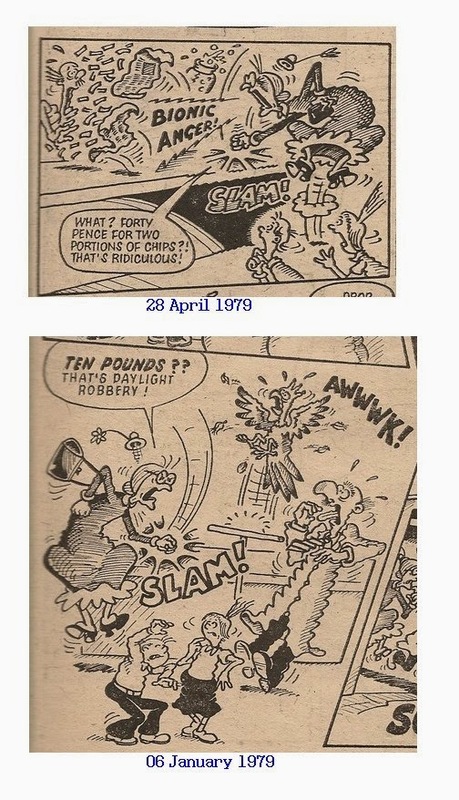 The equivalent days in 1978 were shown as Friday and Saturday. 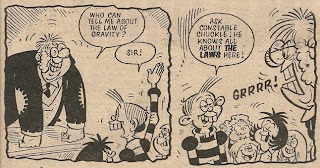 I was surprised to discover over at the Kazoop blog that among the strips in the 1983 Shiver and Shake Annual, which was published towards the end of 1982, was an appearance by Cheeky Weekly's own bulging buffoon, Tub. Our portly pal had simultaneously appeared in the 1983 Cheeky Annual, and his final appearance in a Cheeky title came in the last ever Cheeky Annual cover-dated 1985. 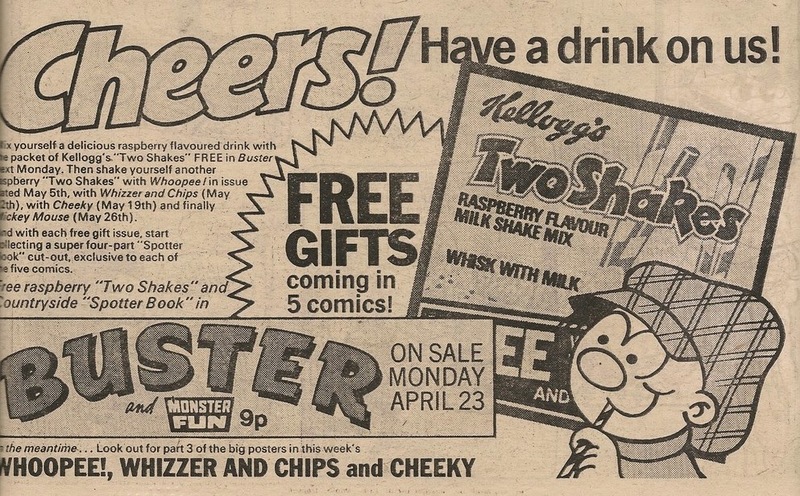 The Shiver and Shake '83 Annual strip was not a reprint, and I didn't expect to see Tub moonlighting in another annual while still on the Cheeky payroll! 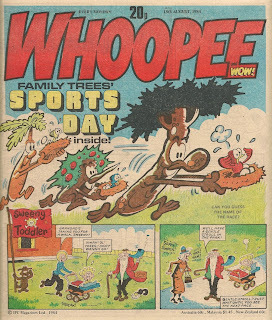 The issue of Whoopee and Wow! 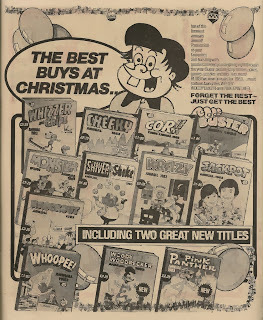 displayed below joined the array of comics vying for attention on newsagents' counters in August 1984. 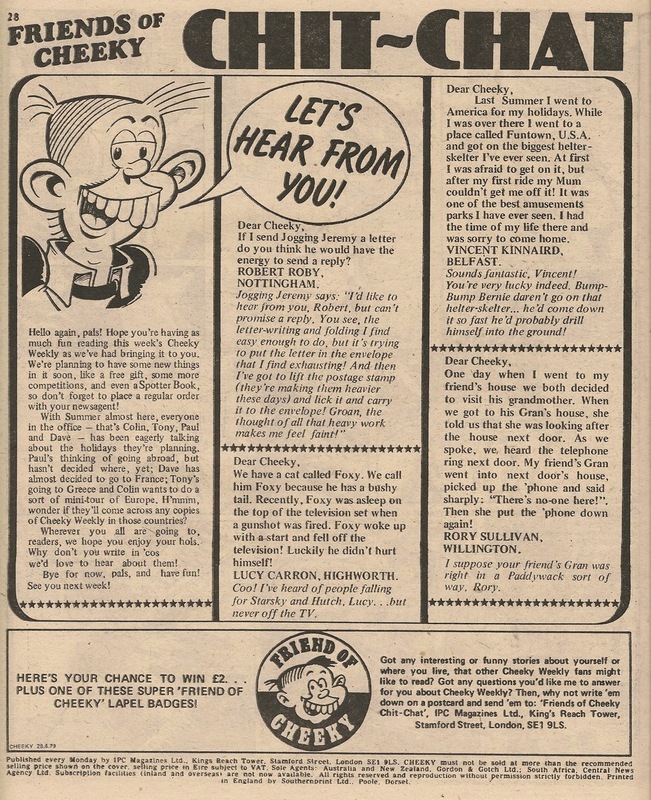 Four and a half years after Cheeky Weekly had been merged into it, reference to the toothy funster's comic had long since been dropped from Whoopee's cover, not least because another failed title, Wow!, had been absorbed just over a year before this issue appeared, and thus gained the companion title slot. 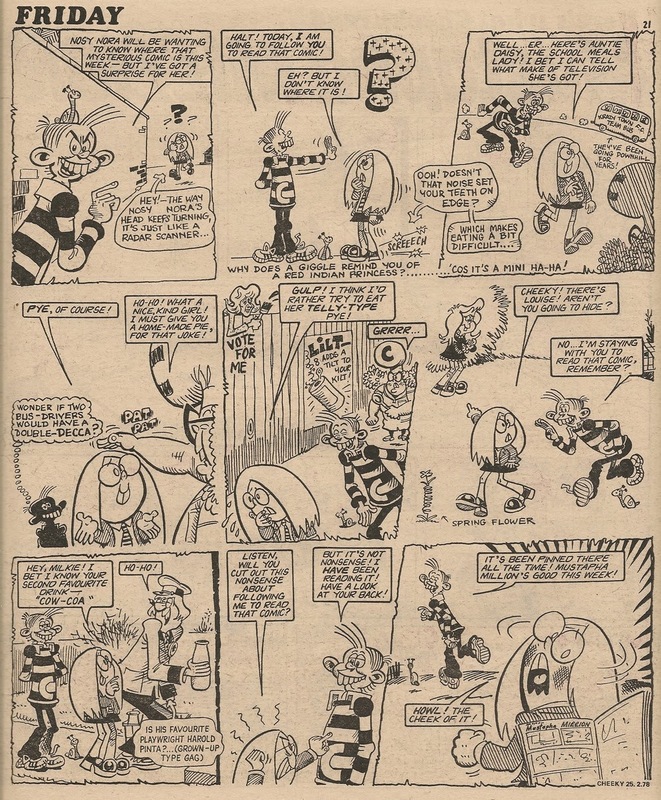 Stage School were still occupying two pages a week, undiminished from their days in the toothy funster's comic. 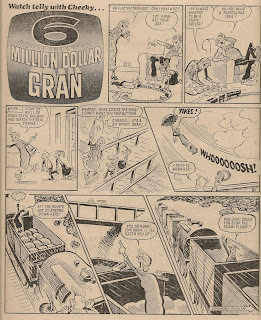 6 Million Dollar Gran had metamorphosed into a seemingly non-robotic role as the leader of Gran's Gang, a single page strip that was something of a come-down after her 3-pages-a-week Cheeky Weekly heyday. 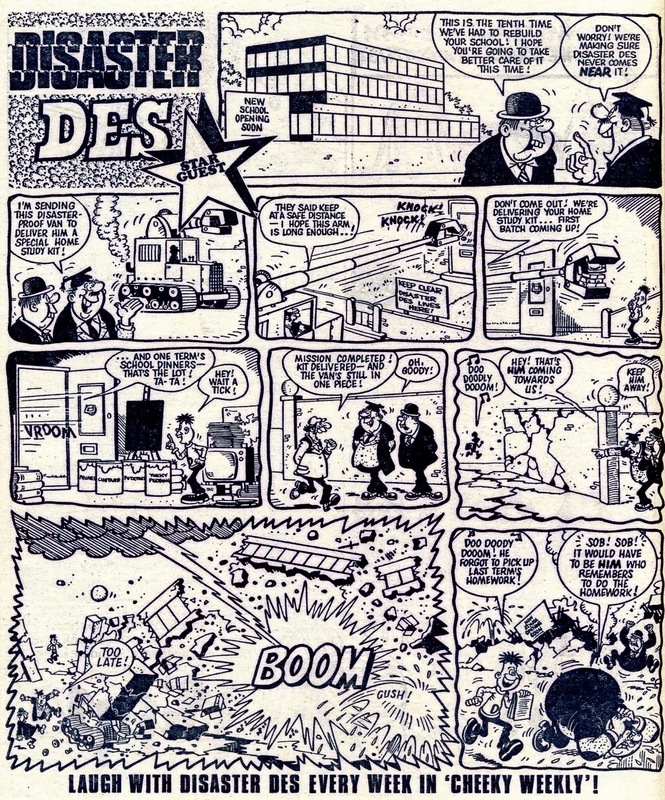 Mustapha Million continued to appear but had recently reverted to reprints of his Cheeky Weekly adventures. 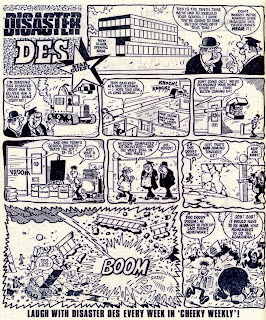 Charlie and Calc's Calculator Kid escapades continued (not reprints), and had in fact generated a spin-off strip, Calculator Corner. 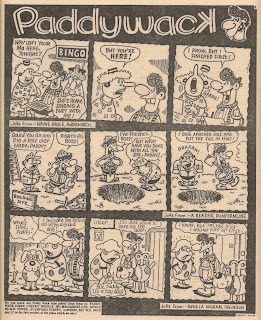 Paddywack persisted with his brand of bumbling buffoonery. 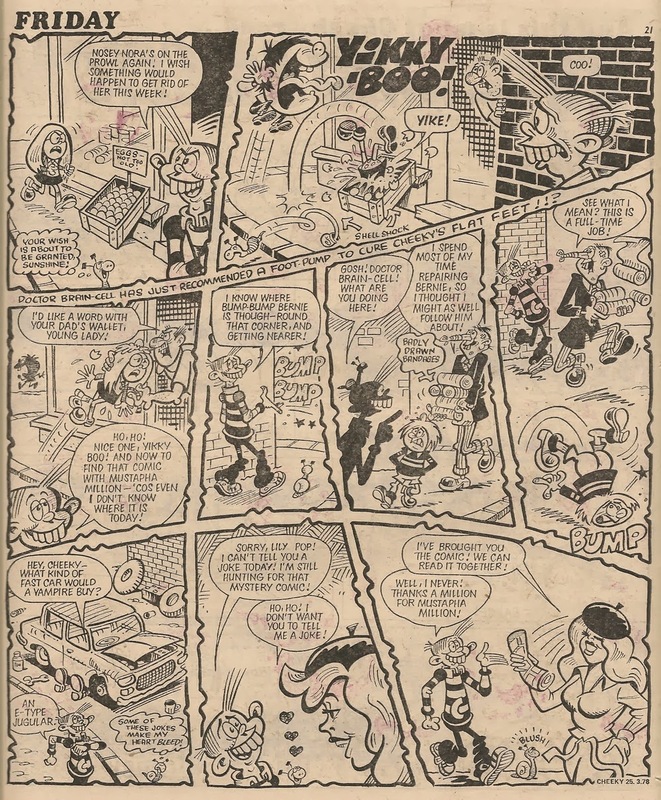 Ironically, Cheeky himself had suffered the worst ignominy, and from being the star of his own comic was now reduced to a single row of panels near the rear of Whoopee and Wow! This looks a bit odd to me; Gran is the only character in the strip to display a shadow on her body, and casts no shade on the ground to her right. Also her unspecified 'Yak Yak', and indeed her very presence, seems to be entirely ignored by the other characters in the frame. 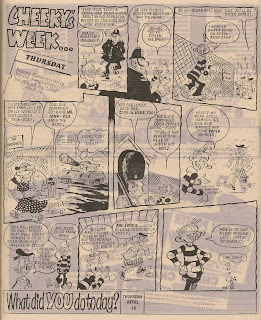 As you can see below, Gran plays no further role in the strip. Strange. 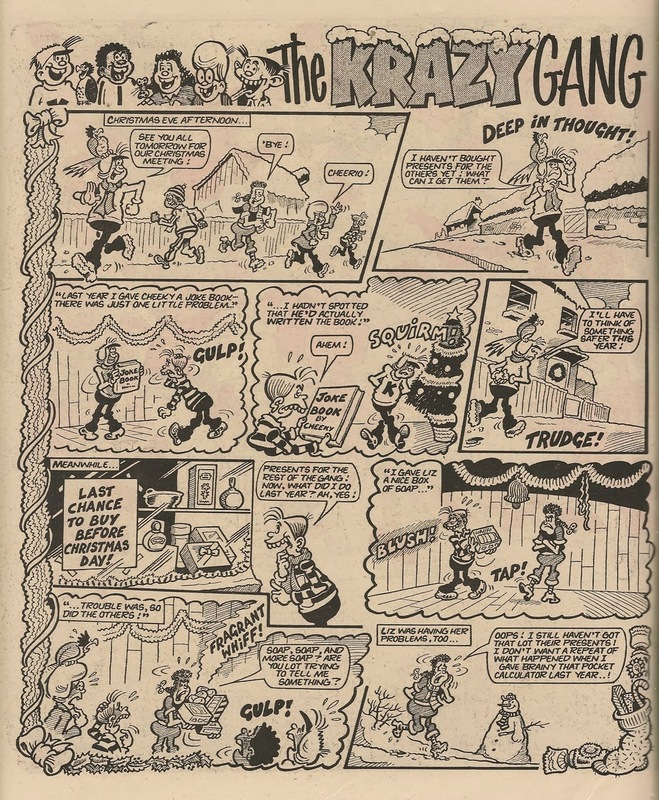 Maybe the aged automaton's presence was meant to suggest that Sweeny's Great Grandpa was a member of Gran's Gang. 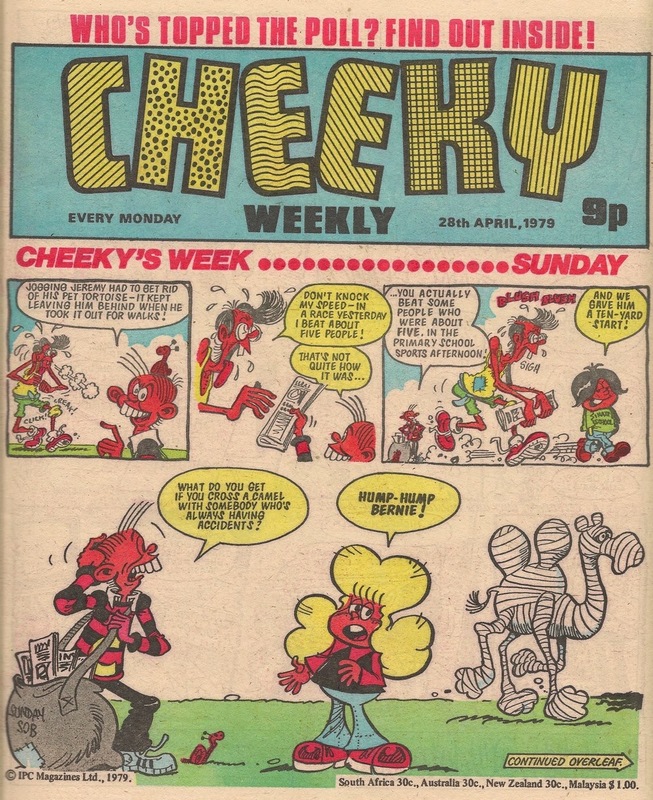 It's always good to see Cheeky Weekly get a mention elsewhere, so head over to Wacky Comics where George is leafing through the pages of the issue dated 10 November 1979 - one I have yet to cover in my series of issue summaries. 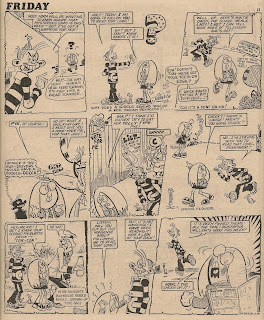 As Andy mentions in his comment on the post, the Cheeky strip artist is misidentified but otherwise it's an interesting view of the toothy funster's comic from (can it really be?) 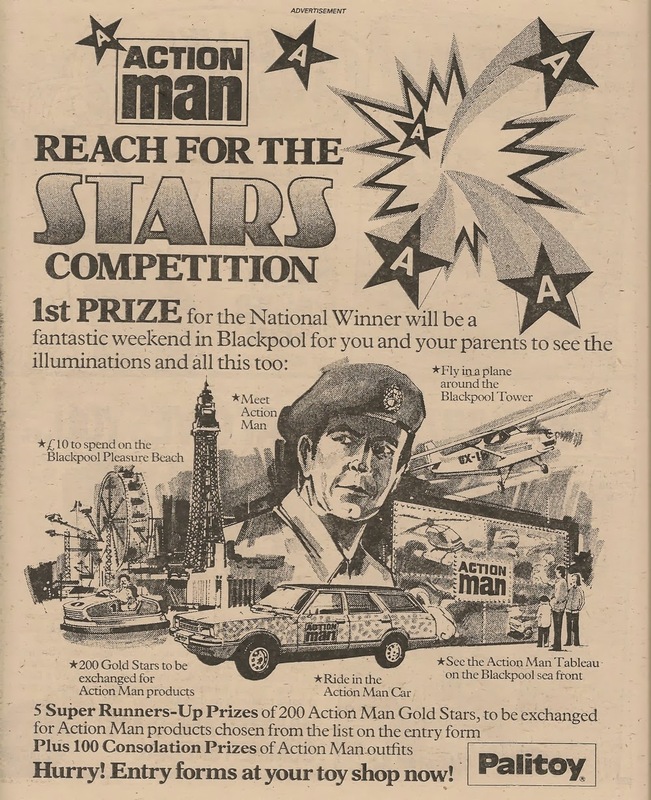 34 years ago. 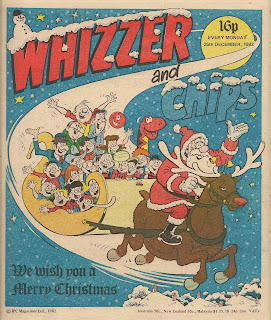 As IPC's Star Guest run for 1979 entered its third week, the alternating nature of the placement of strips meant it was the turn of Whizzer and Chips to host a feature from Cheeky Weekly. 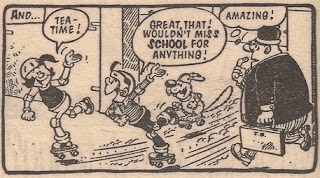 On this occasion it was the dauntless Skateboard Squad who were chosen to represent the toothy funster's comic. 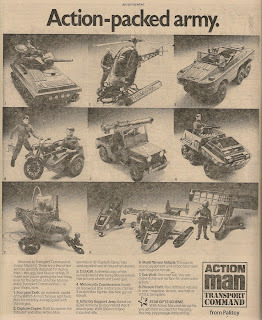 The story (not a reprint from Cheeky Weekly) in which our heroes deputised for an out-of-commission stunt biker gave an opportunity for the Squad to demonstrate their prowess on skateboards to those Whizzer and Chips readers unfamiliar with the feature. 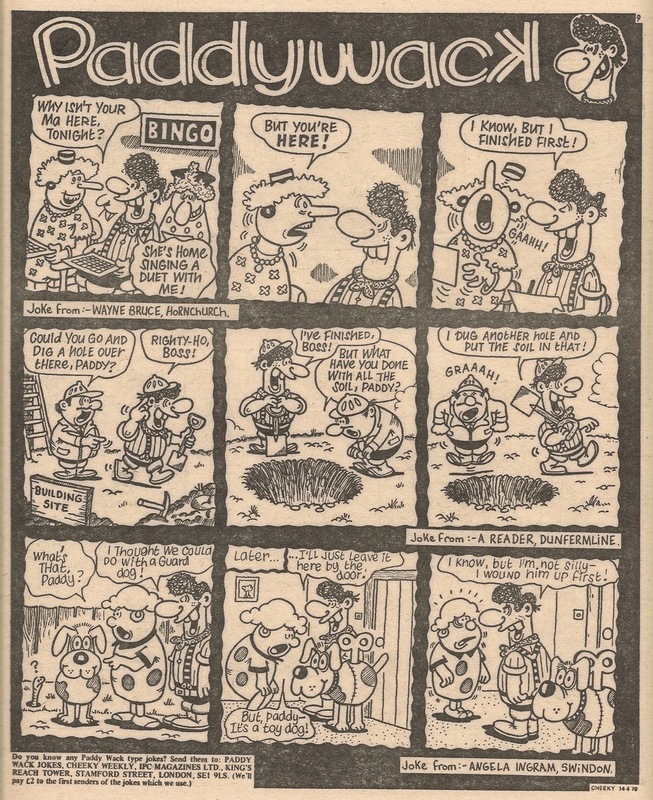 This was the only Skateboard Squad episode in which our pooch pal Wipe-Out was seen to converse with his companions (although he appeared to speak in the 18 November 1978 issue of Cheeky Weekly). 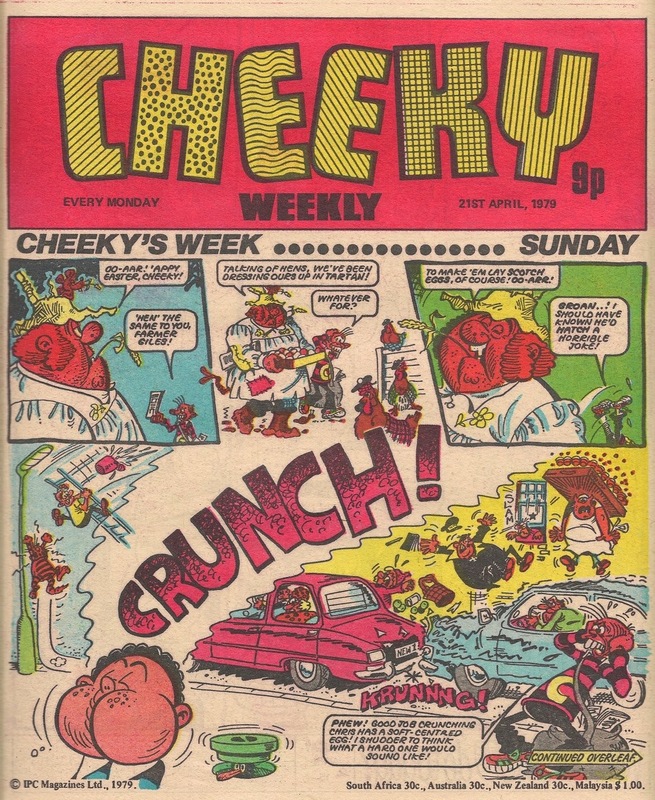 In the same week that the above page appeared in Whizzer and Chips, The Skateboard Squad were absent from Cheeky Weekly which, in its own run of Star Guests, was hosting Whoopee's Sweeny Toddler. 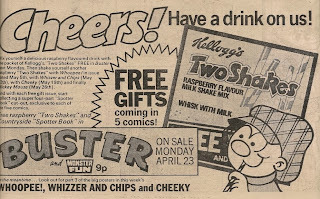 Cheeky Weekly's final Skateboard Squad episode would appear just 4 weeks after their Whizzer and Chips Star Guest outing. 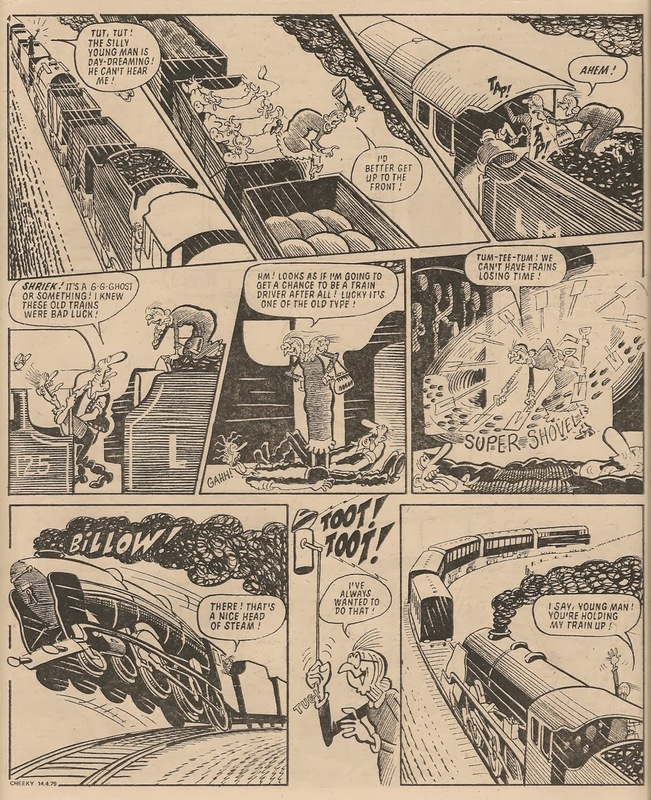 However, the intrepid trio returned to the pages of the toothy funster's comic after a 2 week break, in their new guise as the Speed Squad. 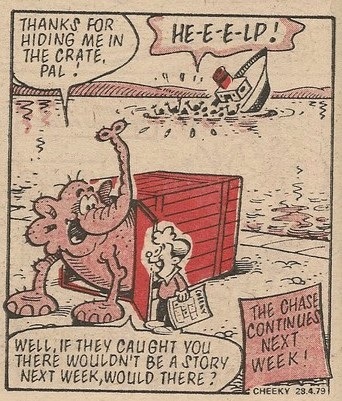 Nosy Nora made her debut on the Friday page of Cheeky Weekly's first issue, in pursuit of the toothy funster as he himself tracked down The Mystery Comic. 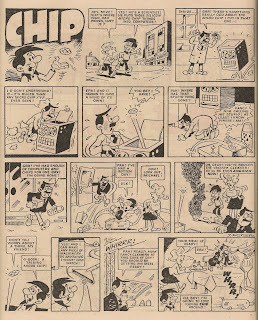 In her first outing it's not clear whether Nora was previously aware of The Mystery Comic's existence, but in the majority of her subsequent appearances she dogged Cheeky as he sought out that perplexing publication, in order that she could read it herself. 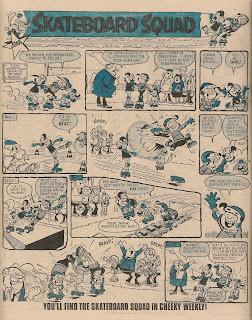 Unlike most of the Cheeky's Week supporting cast, whose appearances would usually be limited to a maximum of three consecutive panels as they participated in a gag with Cheeky, Nora's pursuit of the elusive comic would regularly span a whole page (although she didn't necessarily appear in all the panels). 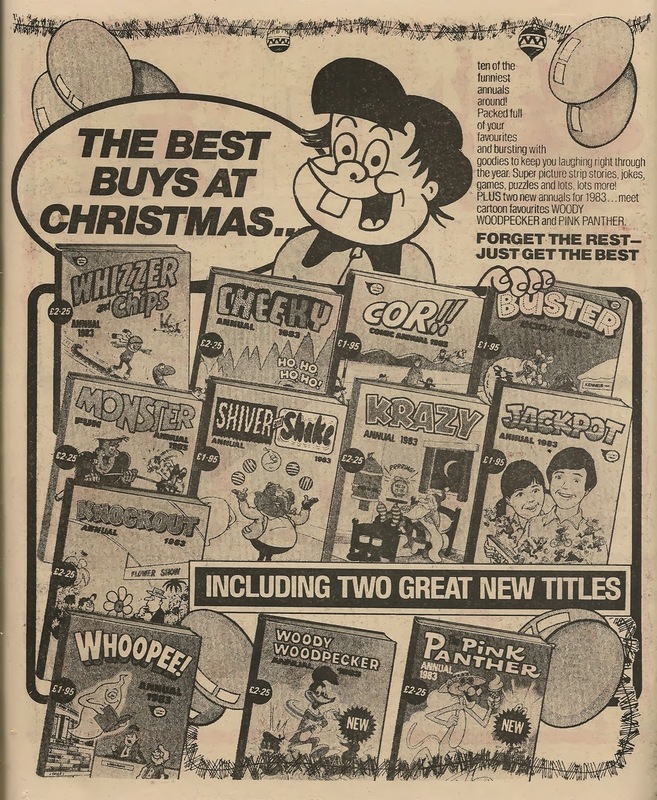 Nora lacked perseverance and would often depart in despair of ever seeing The Mystery Comic just before Cheeky acquired his copy. 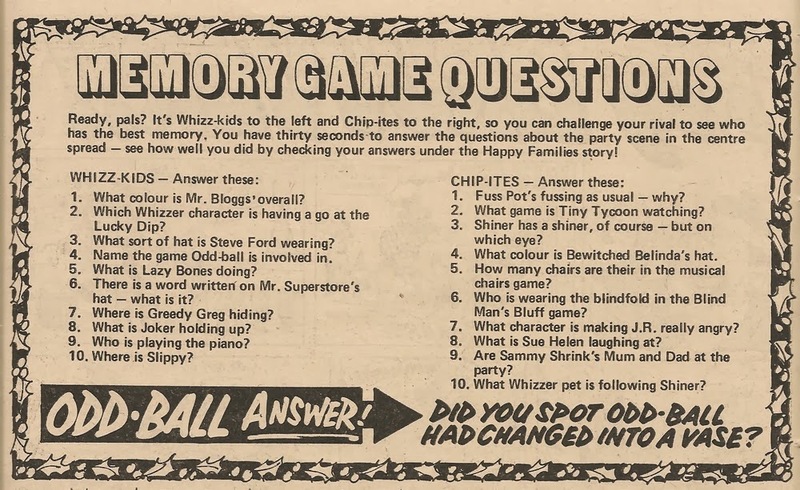 in the first issue of Cheeky Weekly. 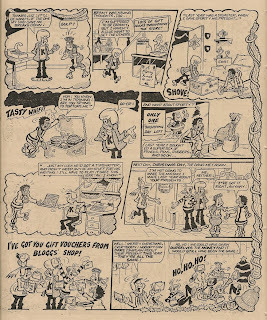 In the 25 February 1978 issue Nora was unwittingly the source of The Mystery Comic, but in the following issue (04 March) she obtained a copy of the coveted publication before Cheeky was able to track it down, thanks to Baby Burpo who was exacting revenge on the toothy funster for forgetting the terrible toddler's birthday. Cheeky got his own back the next week when sneaky snooper Nora was unable to leave home while suffering from a cold. 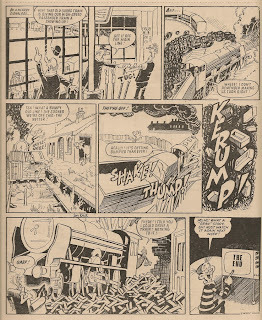 Our grinning pal stood outside her house reading the comic just beyond range of Nora's glasses as she peered forlornly out of the window. In the 25 March 1978 comic Nora was frightened by Yikky-Boo in the second Friday panel and failed to pursue Cheeky as a result. 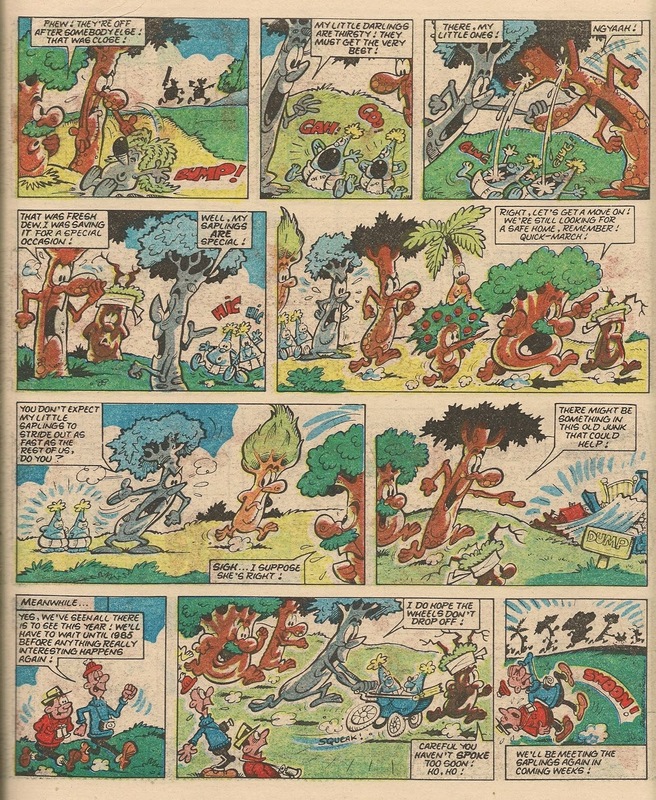 It seems the event proved traumatic, as this strip brought to an end a 23-week run in which Nora attempted to pursue Cheeky in search of The Mystery Comic every Friday (Mustapha Million's strip followed the Friday page every week in this 23 issue sequence - his was the only Mystery Comic story to appear in Cheeky Weekly until the end of September 1978). 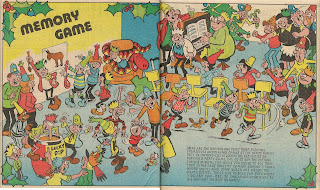 In the following issue, Nora migrated to the Wednesday page, where she was seen among a bunch of Cheeky's pals in just a single panel. 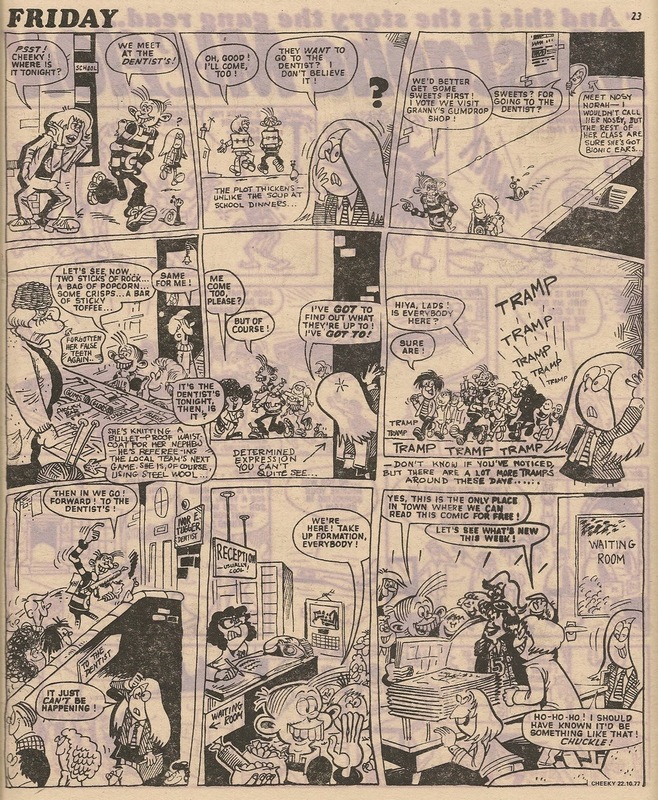 Nora was then absent from the comic for 11 issues (despite Cheeky continuing his weekly search for The Mystery Comic), returning on Friday in the 12 August 1978 comic, where she introduced the Calculator Kid story on the following page (Mustapha had relocated to the page after Thursday as of 01 July 1978). This was the final time that Nora was named in the pages of Cheeky Weekly, although she did appear in a further 4 issues. The first of these final outings came after a 4 week gap, when she delivered a couple of lines during the Interval. A further 29 weeks passed without an appearance by Nora, until she was seen sporting a facsimile of the toothy funster's trademark jumper in 31 March 1979's special issue. 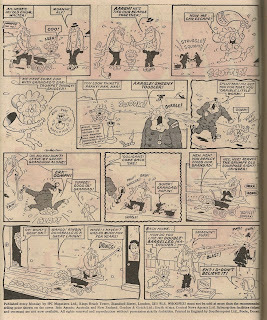 Mike Lacey drew Nora in 2 Cheeky's Week elements in the comic dated 16 June 1979, neither of which were speaking roles. 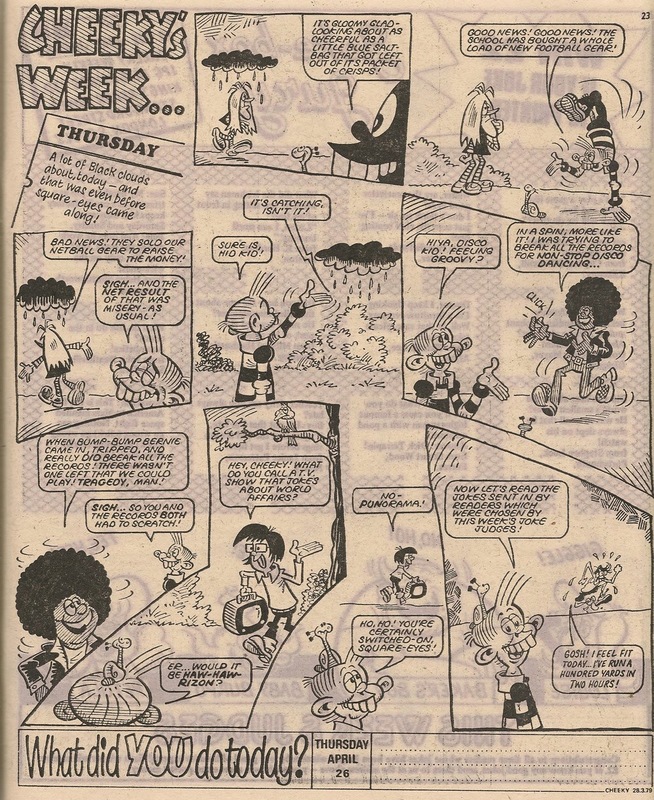 Nora's final nose around the pages of Cheeky Weekly came in the 14 July 1979 comic, when Mike Lacey depicted her (silently) among Cheeky's classmates at school. 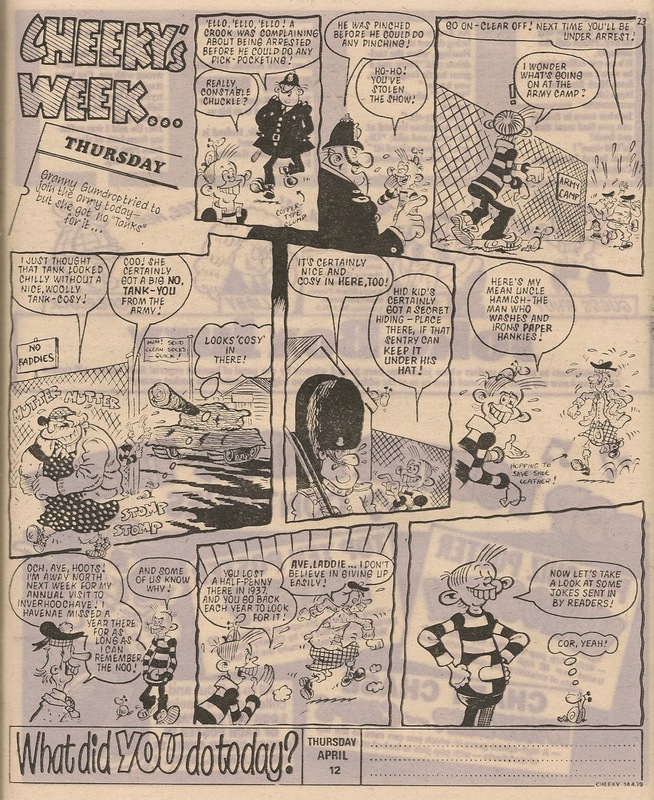 In her first Cheeky Weekly appearance, Krazy Town's schoolgirl snooper was named Nosy Norah (although in the same panel the word was also spelled 'nosey'). 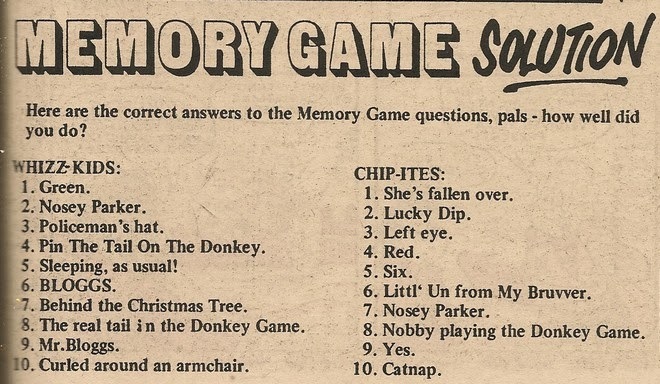 She was also referred to as Nosey Nora on 2 occasions, but the usual spelling was Nosy Nora. 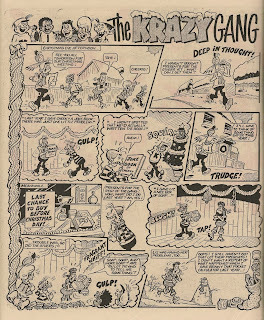 Nora appeared, partially obscured by Auntie Daisy, as Cheeky and his pals invited readers to join them in Cheeky Weekly, in the 'Ello, It's Cheeky strip in Krazy's final issue. 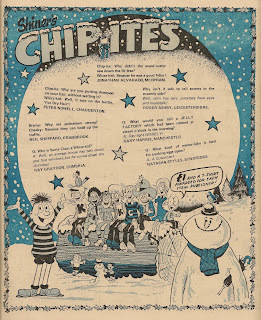 I never cared very much for the antics of Chip, whose first installment intruded upon the Cheeky section of Whoopee! 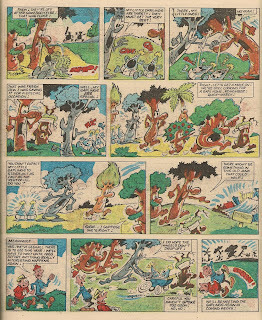 the week after it absorbed the toothy funster's comic. Chip's basic premise was uncomfortably close to that of the far superior Cheeky refugee Calculator Kid, who appeared in that very same Cheeky pull-out. 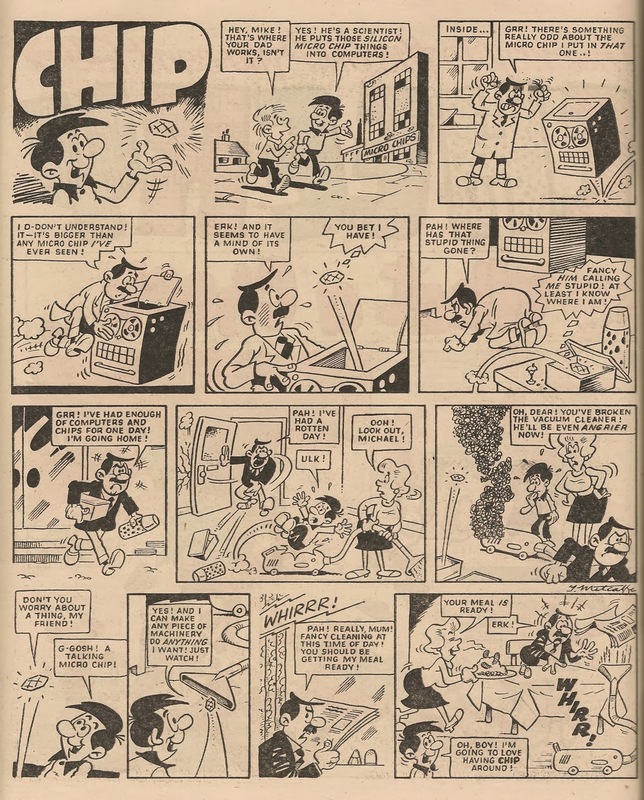 Both strips featured a young lad with a small, electronic sidekick, but the idea of an intelligent, talking calculator somehow required less of a suspension of disbelief than was needed to accept stories about a flying microchip which could, by some unexplained means, animate any number of unlikely objects, electronic and otherwise. 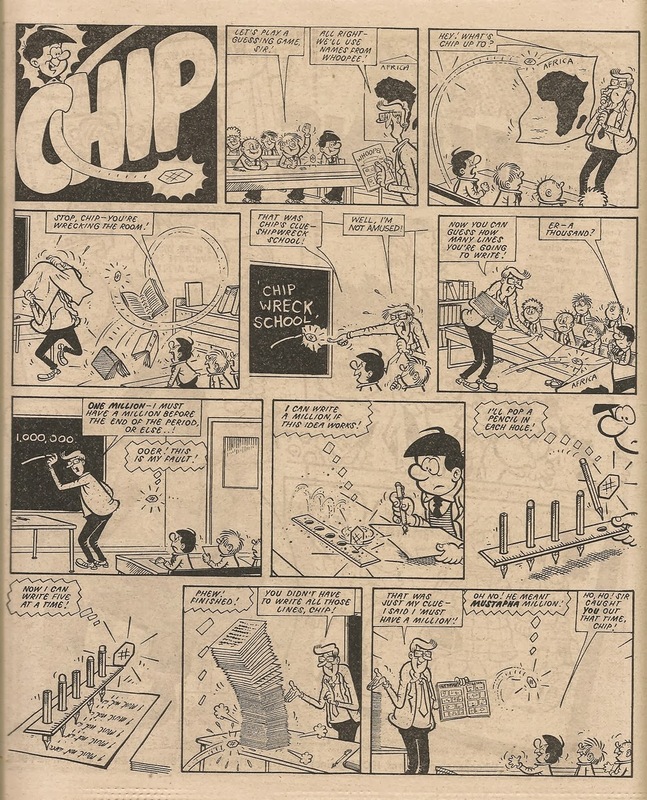 Additionally, Charlie's Calculator was almost entirely infallible whereas Chip's intervention in a situation usually signalled a (tedious) minor disaster. 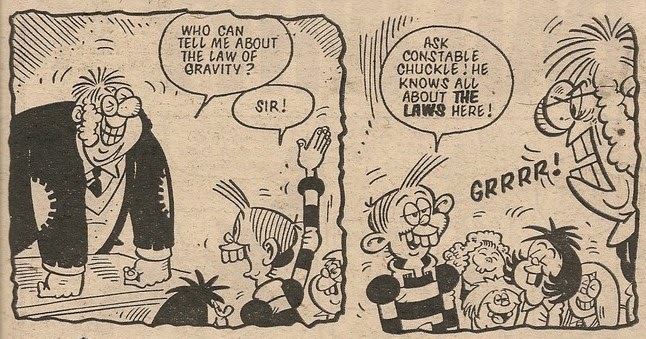 Quite how the Whoopee! 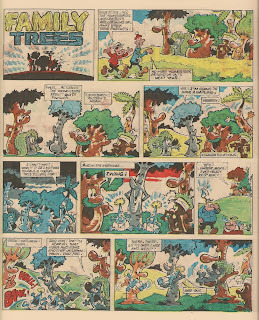 editor allowed two similarly-themed strips to run concurrently for such a long time, particularly when their proximity within the pages of the same comic served to highlight just how poor Chip was, is something of a mystery. 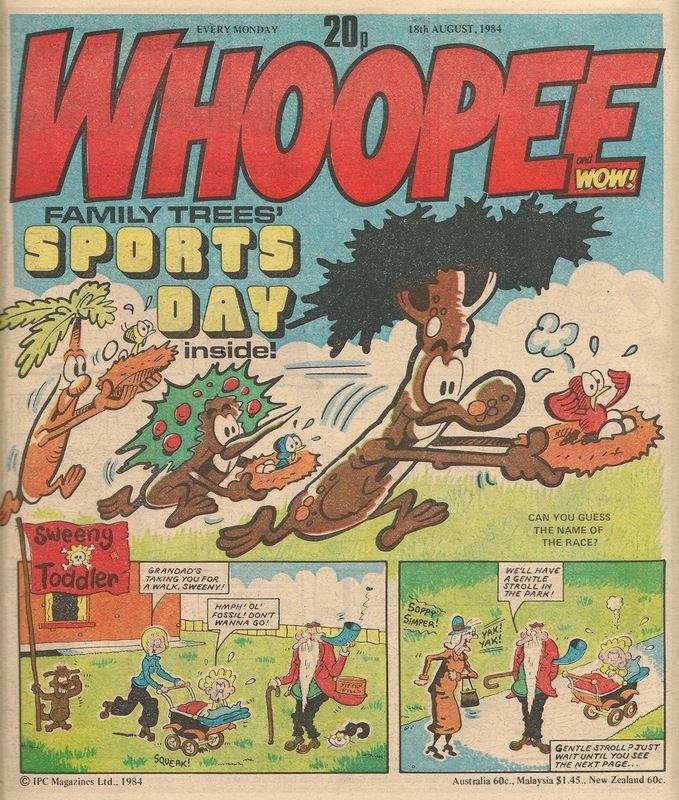 With my rather tetchy preamble out of the way, in this post I want to focus on the Chip episode from the 09 June 1984 issue of Whoopee and Wow! 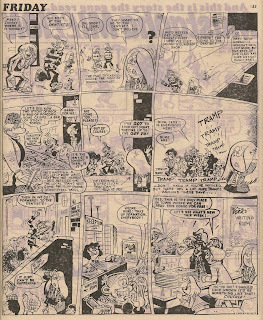 By this time Mike Lacey had taken over the artwork duties (maybe Trevor Metcalfe shared my view that the strip was less than scintillating and bailed out). 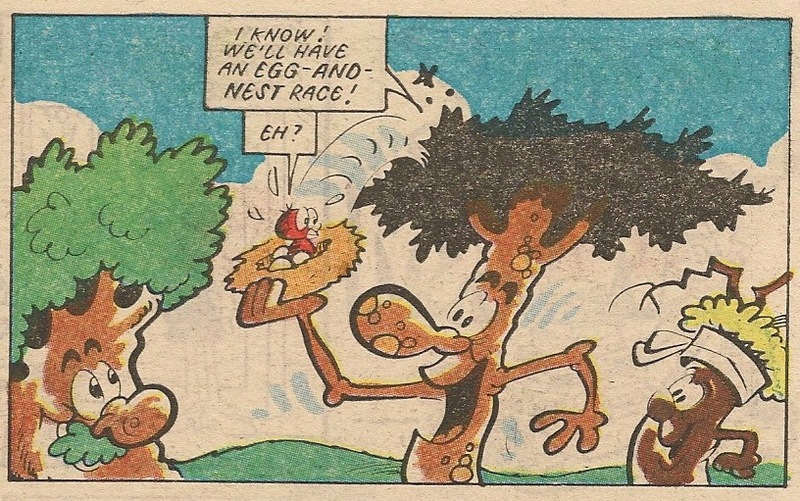 In this particular episode, another feature from the same comic, Calculator Kid's Cheeky Weekly co-survivor Mustapha Million, gets a mention in a rather feeble gag.